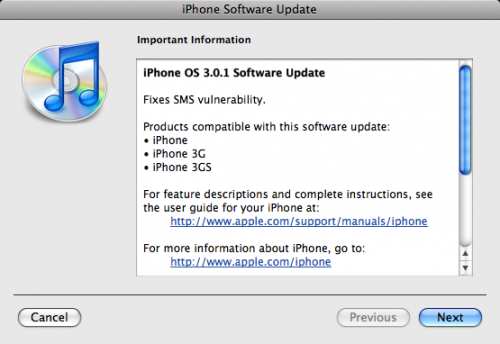 Apple today released iPhone OS 3.0.1, addressing an SMS security vulnerability disclosed at yesterday's Black Hat cybersecurity conference in Las Vegas. The release of iPhone OS 3.0.1 has been expected since a spokesperson for UK iPhone carrier O2 claimed earlier today that a fix for the issue would be coming from Apple on Saturday. Apple has also posted a security document describing the issue. 230.1 MB for 3G. Just finished downloading.